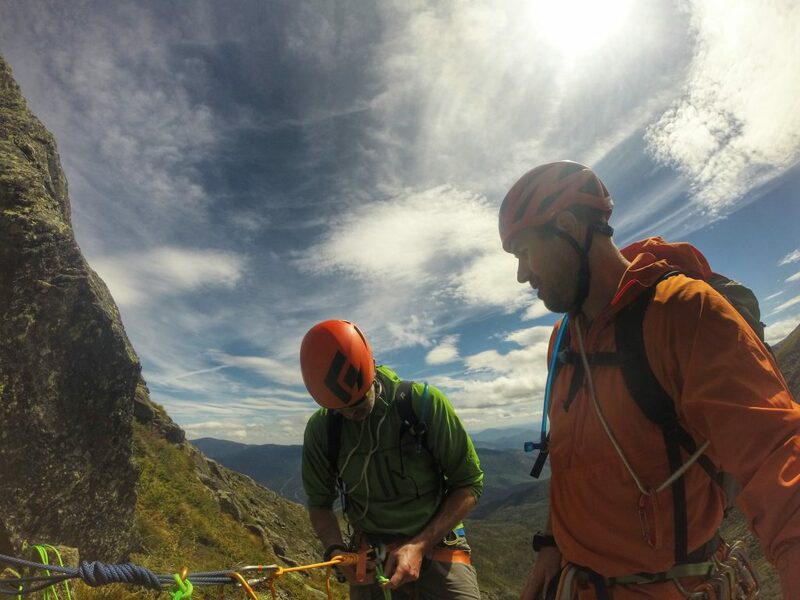 The Northeast is filled with fantastic opportunities for alpine climbing, with much of it at a modest grade. 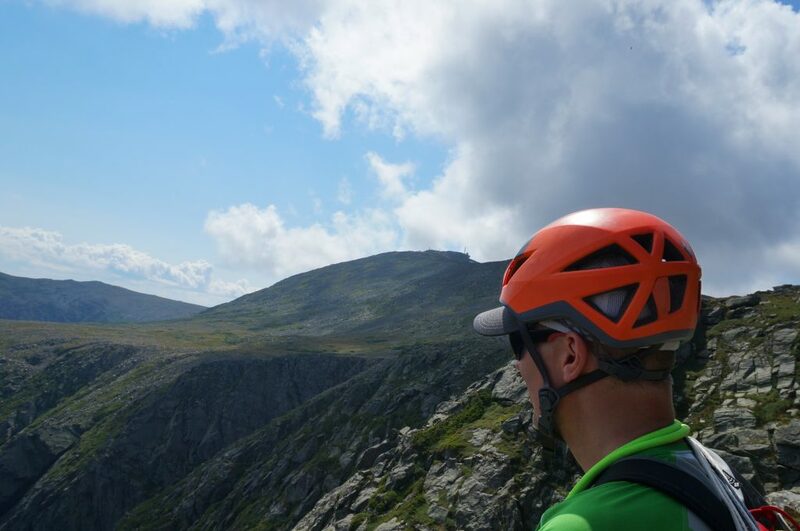 For instance, a few iconic places like the Whitney-Gilman Ridge on Cannon Mountain, the Armadillo Buttress on Mount Katahdin, and the Northeast Ridge of the Pinnacle on Mount Washington offer great New England moderates at a 5.7. Occasionally, however, 5.7 can feel like 5.9, especially on classic climbs previously graded 5.7 – once considered the peak of difficulty. Sometimes, climbers seek the alpine experience without all the arduousness and fear, and instead would prefer to test themselves on an easier route, work out their systems, and evaluate their readiness before moving onto bigger treks higher in the mountains. 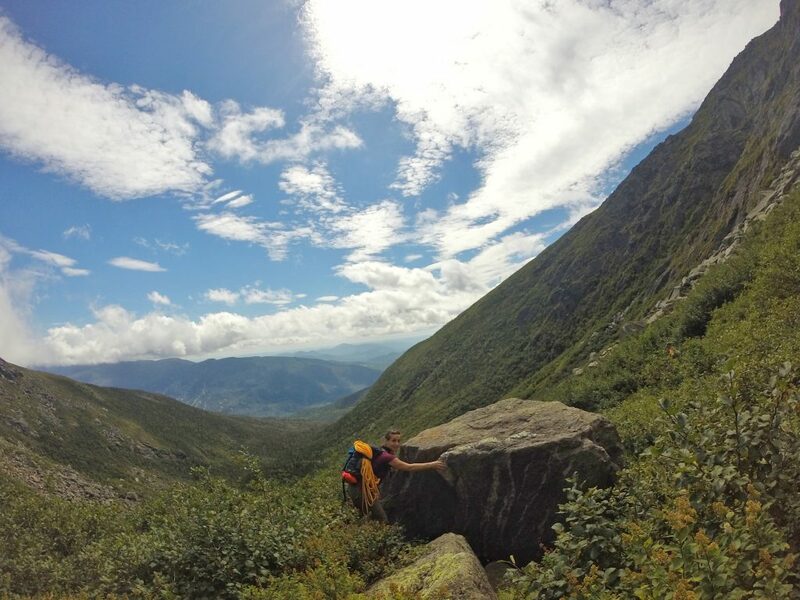 Henderson Ridge in Mount Washington’s Huntington Ravine is the perfect proving ground for both aspiring alpine climbers and the everyman looking for a weekend adventure. For one, it delivers a big route on a quintessential New England mountain while offering beginner-friendly climbing no harder than a 5.4. 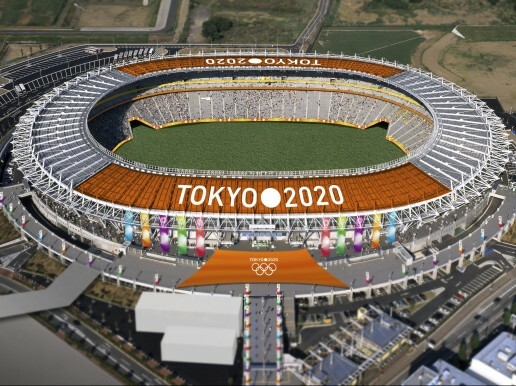 Even better, it’s located directly across from the Northeast Ridge of the Pinnacle, perhaps giving a glimpse of a future objective – if things go well, that is. Like many alpine climbs, the approach to Henderson Ridge is lengthy and will have you considering what is vital to take. Over the years, my rack has gotten noticeably smaller, the rope has gotten shorter and skinnier, and energy gels have replaced real food to minimize the amount of gear I’ll carry during the two-plus miles and nearly 3,000 feet of elevation to the base. 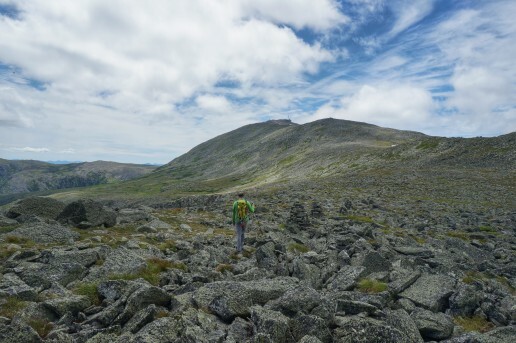 While thinning out the pack is important, it’s critical to remember that Mount Washington is “home to the world’s worst weather,” and bright, sunny days can quickly become windy, rainy, snowy, and miserable, so pack accordingly. Furthermore, this is a traditionally protected climb with no fixed gear, so you should bring enough supplies to safely get through the route, know how to properly place trad gear, and be comfortable building your own anchors. If you’re a first-timer, bring a standard rack of small- to medium-sized cams and a set of stoppers, as gear placements are abundant. 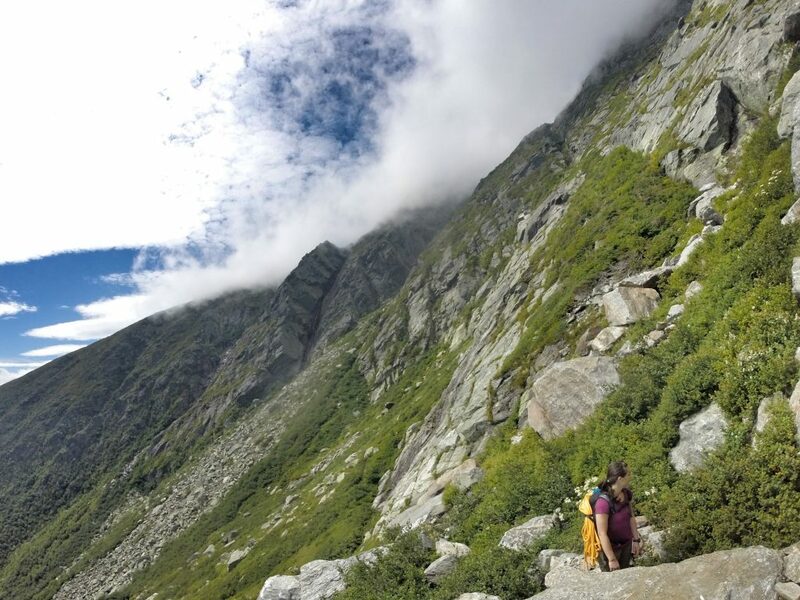 The most common way for climbers to reach Henderson Ridge is via the Tuckerman Ravine Trail to either the Huntington Ravine Cutoff Trail or the Huntington Ravine Trail, and then follow the trail to the base of the ravine. From the ravine’s base, Henderson Ridge is the prominent rib of rock on the far right that occasionally and dramatically juts out over North Gully. To reach Henderson Ridge, continue moving up the trail, until you are near level with the beginning of the ridge and start bushwhacking over to it. On some visits, I have been able to find what I think is a faint climber’s path that made the traverse easier. Other times, I have not and have been nearly swallowed by undergrowth. Depending on the bushwhack you choose, this traverse may seem like a few forgettable moments before the climb or become the hardest thing you’ll do all day. Of course, if none of this sounds appealing to you, there is always what I have heard referred to as the lazy, luxurious, or smart approach to Henderson Ridge: Just drive up the auto road, and descend to the climb. The technical beginning of Henderson Ridge is fairly obvious, as a large sliver of rock dips into the lower ravine’s vegetation to form a sharp ridge above North Gully. In my experience, the first pitch is often the route’s hardest point, as my legs struggle to adapt from the uphill hike to the few delicate slab moves you need to make. While I have often climbed Henderson Ridge using only my approach shoes, there have been moments on the first pitch where I have wished for a pair of real climbing shoes. To continue from the top of the first pitch, hug the ridge for three or four more rope lengths through the increasingly blocky terrain. Then, sustained climbing ends on a large ledge above what’s known as the “diving board,” an incredible feature hanging out over North Gully. Climbers comfortable with exposure will love walking the plank, taking in the fantastic view, and feeling the air beneath their feet. While most climbers will de-rope and scramble after four pitches, first-timers may want to keep the rope out, depending on their comfort with the terrain, their abilities, and location, as there are still some steep sections and intermittent portions requiring more technical skills. Those not satiated with the first four pitches can then scramble left and find a few more rope lengths in North Gully. At the top of Henderson Ridge or North Gully, climbers can connect with the Alpine Garden Trail. From here, you can choose to go to Mount Washington’s summit via the Nelson Crag Trail before going down the mountain, or continue across the Alpine Garden to the Lion Head Trail and begin the descent immediately. For those who did this route auto-assisted, jump in your car and enjoy the drive down. And, for those who wish they’d taken the auto road up, stick out your thumb, and hope someone takes pity on you. 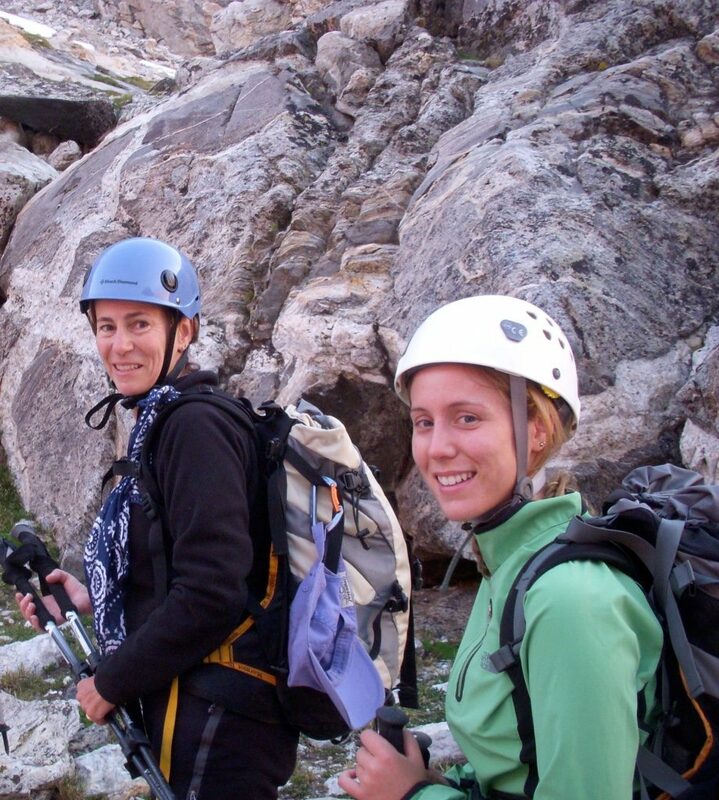 Hike or drive, rope up or solo, summit or go summit-less, or even link it with The Northeast Ridge of the Pinnacle for an alpine extravaganza, Henderson Ridge offers ample adventure opportunities for climbers of all levels. With an incredible setting on a must-visit mountain, it makes the alpine experience accessible to the everyday climber. 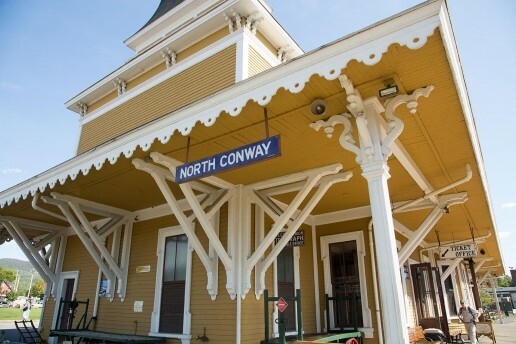 For those seeking the perfect launching pad for outdoor activities, look no further than North Conway, NH. Located at the edge of the White Mountains, the town is surrounded by a wealth of natural wonders and offers visitors terrific après adventure options. Situated just a few minutes from the end of the main drag, Cathedral Ledge and White Horse Ledge loom over the surrounding area. 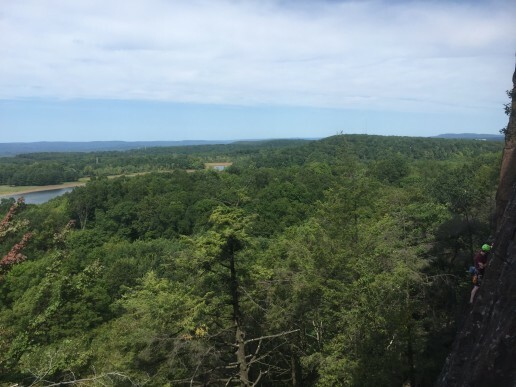 They offer some of the best climbing on the East Coast, from beginner level (a 5.3-rated climb at White Horse Ledge) to advanced (a 5.14a-rated climb on The Mordor Wall at Cathedral Ledge). Take a class with the certified pros at the EMS Climbing School (learn more here), and send famous routes like Thin Air, Fun House, and Toe Crack. Every year from late September until the end of October, tourists from around the world drive the famous Kancamagus Highway (Rt. 112) for its breathtaking vistas and unparalleled fall foliage. The 36-mile stretch from Conway (just south of North Conway, as you might expect) to Lincoln, NH, traces the Swift River and offers many spots to pull off the road. Caves, waterfalls, mountain vistas, and hiking trails (and, of course, the foliage) are just a few of the abutting attractions. Trails abound in the vicinity of North Conway. The Appalachian Trail passes just north of the town along the Presidential Range, encompassing nearby Mount Washington. If you are traveling by car, you can head up the Auto Road (read more about Mt. Washington below), and park in a small lot where the AT intersects with your route. From here, take the Madison Gulf Trail (part of the AT) a mere 0.2 miles to the Lowe’s Bald Spot side trail (0.1 miles) for terrific vistas from atop the Bald Spot, a group of rocks overlooking the Great Gulf Wilderness. For more accessible options, head to the Kancamagus Highway, and select one of the many trailheads along the scenic road. 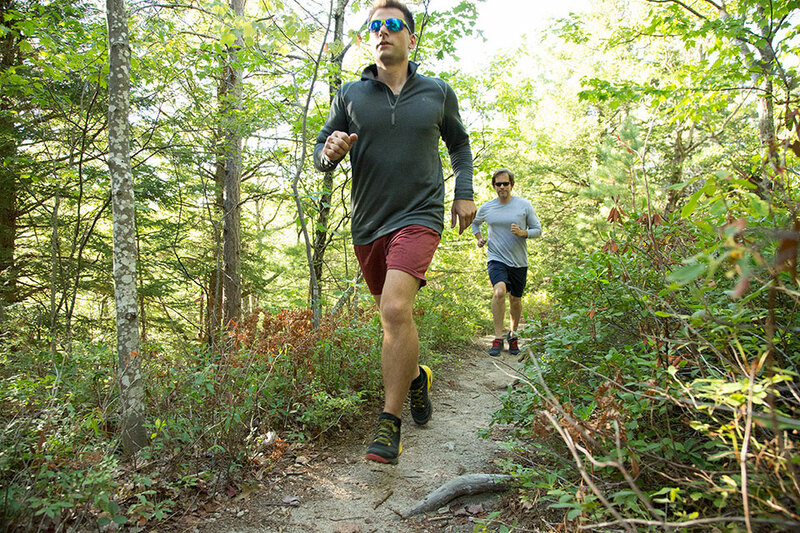 Many of the hiking trails serve well for trail runs. A particularly appealing option is Boulder Loop Trail, along the Kancamagus. 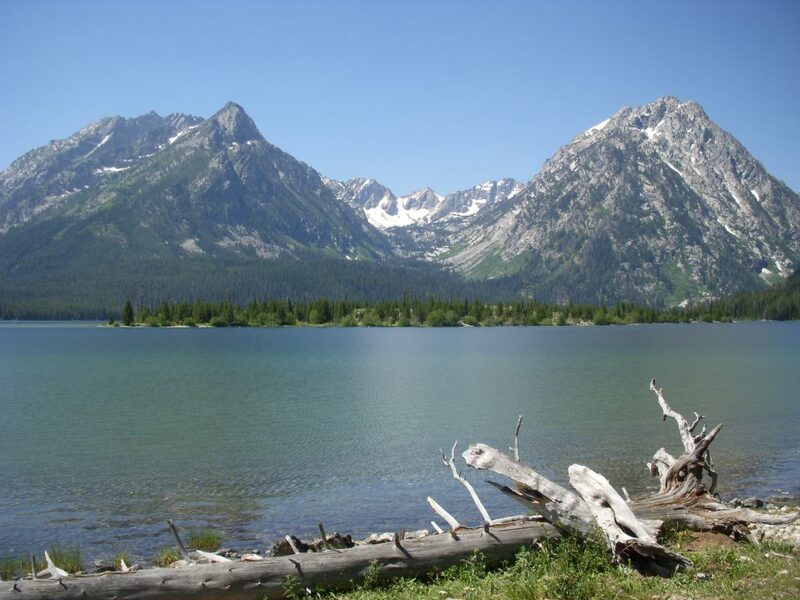 It’s a 3.5-mile loop of moderate difficulty that leads to terrific views of the surrounding mountains. As an added bonus, there’s a historic covered bridge leading to the trailhead. The Saco River runs parallel to White Mountain Highway, which serves as the town’s Main Street, and offers easy access to paddling adventures. Whether you are kayaking, tubing, canoeing, or paddleboarding, the Saco is a terrific option, given its average three-foot depth, meandering path, scenic views, sandy beaches, and rope swings along the way. Not surprisingly (we work for EMS, after all), we highly recommend camping in the vicinity of North Conway. There are many wonderful spots, but Fourth Iron Campground is a particularly appealing option. Open year-round on a first-come, first-serve basis, it’s a walk-in tent site near where the Saco meets the Sawyer River. With parking nearby, the campground features eight sites, each with its own bear box. Another good choice is Barnes Field Group Campsite. As its name implies, this is a larger site well-suited for groups. It’s situated north of town at the foot of Mount Washington and has easy access to hiking and cross-country skiing trails. Keep in mind there’s a fee mid-May through mid-October, and reservations are recommended. By winter, the site remains open on a first-come, first-serve basis. A trip to the top of Mt. Washington is an unforgettable experience. 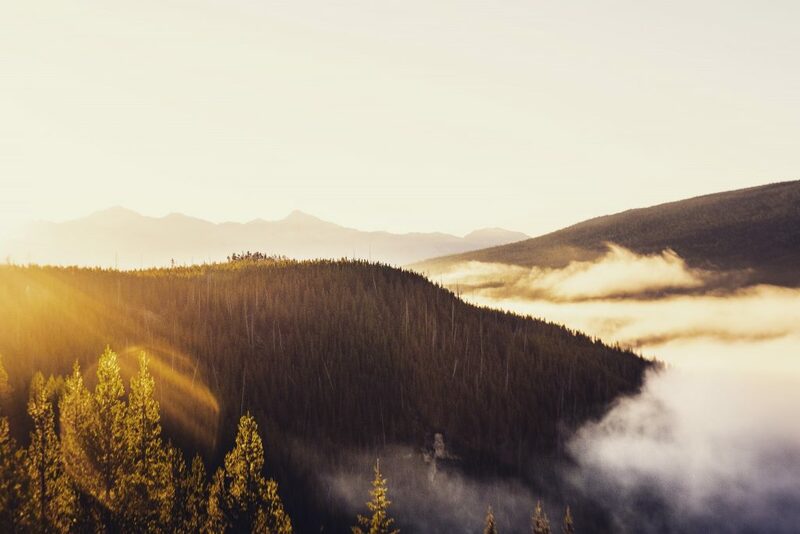 Whether you take the Auto Road in warmer months, ride the old-fashioned Cog Railway, or hike to the summit, the subarctic environment and incredible winds at the peak are something you’ve got to see at least once. The EMS-sponsored Mt. 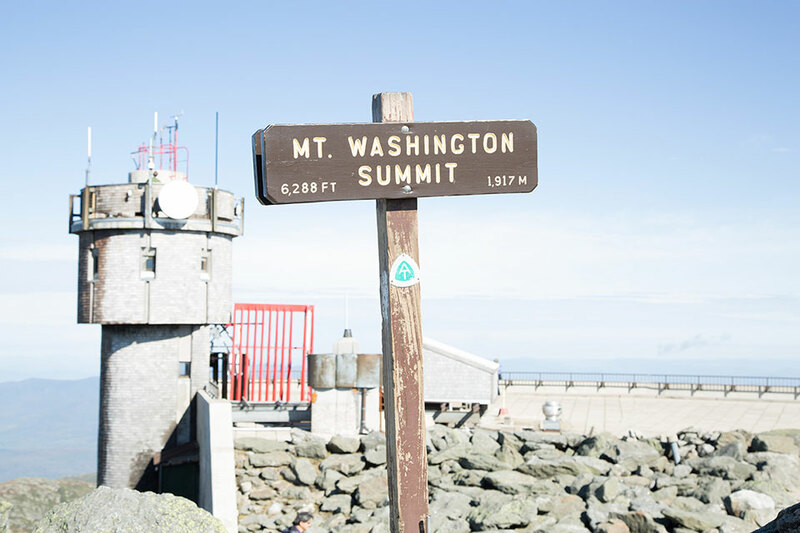 Washington Observatory sits at the top (a 6,288-foot peak) and conducts climate research year-round in what is acclaimed as the world’s worst weather. The fastest wind speed of all time (231 MPH) was recorded at the summit, and the average daily wind speed is a brisk 34 MPH. Visibility can extend to 130 miles on a clear day. With these factors in mind, be prepared for cold weather when you get to the top, regardless of the month. The local EMS store in North Conway can outfit you with everything you need to be comfortable. The proprietor of the local ice cream shop (see below) told us that he moved to North Conway for the excellent mountain biking, accessible from downtown. The East Side Trails are a network of bike trails with easy, moderate, and difficult options. West of town, there are other easier routes that are informally known as the Marshall Preserve trails. If you’re visiting in the winter months, be sure to try out a few of the seven ski resorts surrounding North Conway. Attitash, Cranmore, Wildcat, Bretton Woods, Pine Mountain, Black Mountain, and Loon are all nearby. Whether you’re a beginner or an experienced ice climber, the EMS Climbing School offers personalized instruction to fit your needs. 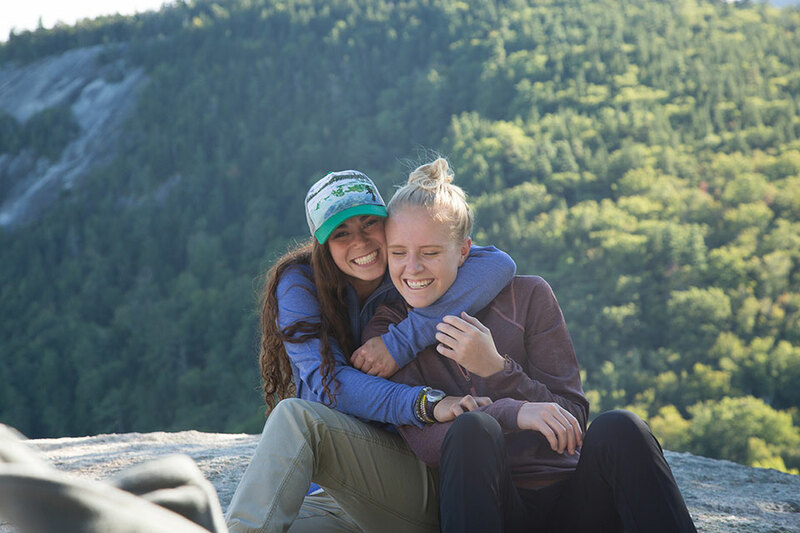 Available seven days a week, our guides will take you to an appropriate site, such as Cathedral Ledge or Frankenstein Cliffs in nearby Crawford Notch State Park. Nursing an injury? 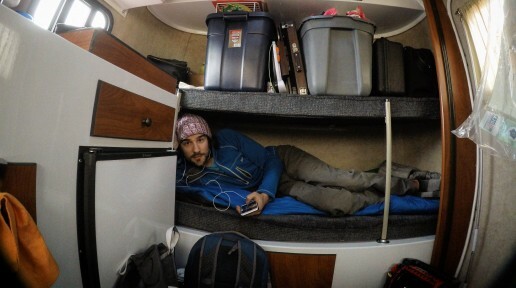 Sore from too many outdoor adventures? See the White Mountains from the comfort of a scenic rail trip. Tours ranging from approximately one to five hours depart daily from the town’s center. A dining car is available on select outings. Speaking of dining, start your day at Peach’s on Main Street, a terrific spot for breakfast, brunch, or lunch. Think family home converted into a restaurant: Dining tables are spread throughout the small rooms, and the back of the house looks out over woods. And the food! An EMS colleague summed up the experience well when he said, “Man, these pancakes are LEGIT.” The same could be said of everything else we ordered. Skip lunch. Instead, go straight for ice cream at #PieWholeStuffer (aka 18°C) right in the center of town on White Mountain Highway. Made out of simple ingredients and spun right on the premises, it’s absolutely the best ice cream I have ever tasted. The selection changes daily, depending on what’s in season, so I would recommend covering your eyes and pointing randomly at the display case. You can’t go wrong. For the ultimate in après adventure dining, I would recommend firing up your JetBoil MiniMo at the campsite and enjoying Good To-Go’s dehydrated Pad Thai (you need those if you don’t have them). But, if beer on tap is an important consideration for you, then spend an evening at the Red Parka Steakhouse & Pub in nearby Glen (just a few minutes north of North Conway). The steaks and ribs are excellent, but the main attraction is the pub itself. The old-school ski theme sets just the right mood for reliving the activities of the day. The Red Parka isn’t the only game in town, though. Horsefeathers, Moat Mountain, and the Muddy Moose are just a few of the local spots that will take care of you after a long, active day. 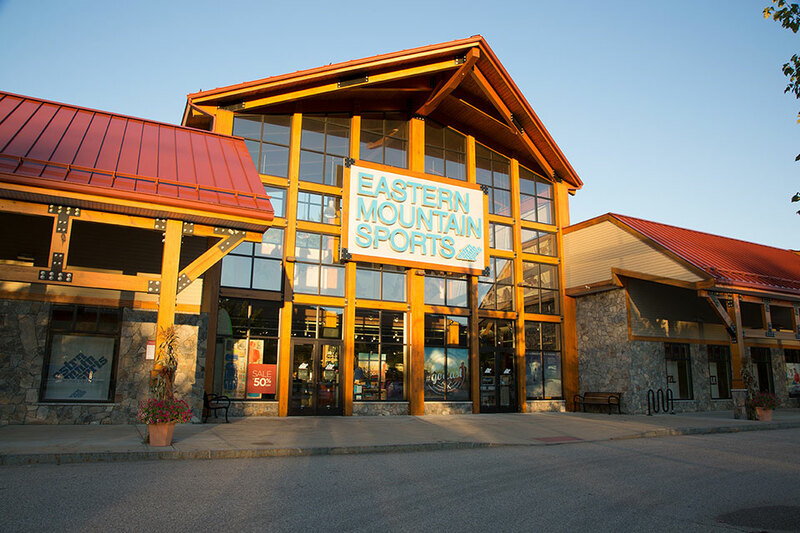 Eastern Mountain Sports is located right on White Mountain Highway, and there are some other stores in the area (hey, I’m biased). Choose from the Velocity, Refugio, or Big Easy series of EMS brand tents. Very comfortable. Oh, there are plenty of fine hotels in the area, but this is North Conway: Do it up in style, and camp like you know you want to! As the East Coast’s oldest climbing school, the EMS Climbing School has been guiding clients up the Northeast’s classic spots and providing technical instruction to those looking to hone their skills since 1968. Although sending Whitehorse slabs, cruising Cathedral cracks, and rocking over roofs in the Gunks out of our North Conway and New Paltz locations are the first thoughts that spring to mind for many of our customers, the truth is, there are many great climbing sites outside of these two destination locations. Even better, the Eastern Mountain Sports Climbing School guides at many of those places! EMS Climbing School guide Mike Lackman got his start on the short cliffs of eastern Connecticut and transitioned many of the techniques and skills he developed there to the Northeast’s big alpine sites, such as Cannon, Mount Washington, and Katahdin, as well as to Wyoming’s Tetons and Wind Rivers and Washington’s Northern Cascades. 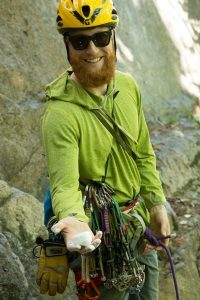 While you can still find Mike guiding out of our North Conway location, he loves sharing the same cliffs where he developed his passion with new and experienced climbers alike. A nice bonus for Mike is that the season lasts a little longer in Connecticut than it does in North Conway due to its more southerly longitude and the dark nature of the rock (think Send-tember, Rock-tober, and Go-vember). 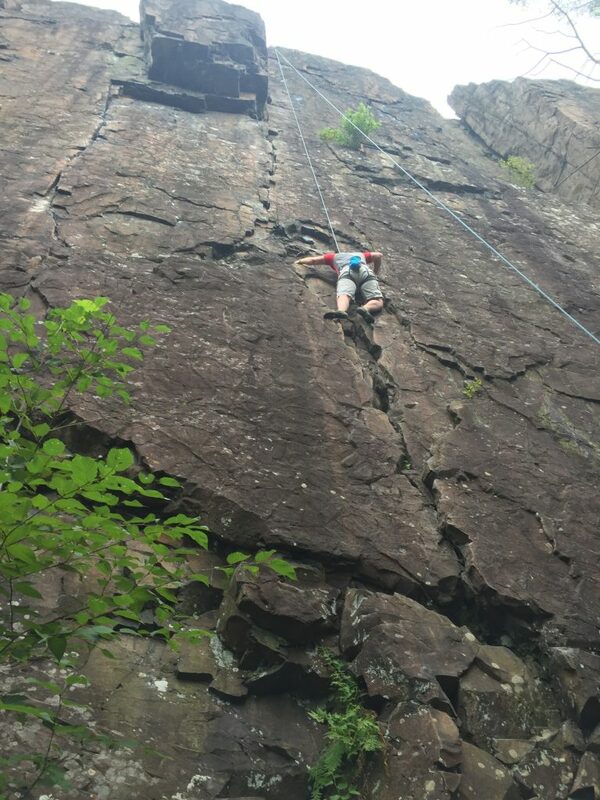 The Eastern Mountain Sports Climbing School primarily guides two locations in Connecticut—Ragged Mountain and Pinnacle Rock—and both sites have something for individuals of all abilities. Need another reason to try one of these lesser-known locations? Many of these spots have history’s most notable climbers as first ascensionists: Fritz Wiessner, who gained notoriety for his near-summit of K2 in 1939; Layton Kor, first ascensionist of two of the Fifty Classic Climbs of North America; and notorious Northeast climber Henry Barber, who has too many accomplishments to list. So when ascending many of these Connecticut classics, you’re also following in the footsteps of some of the sport’s greats. Convinced on Connecticut climbing? Awesome! Below are Mike’s five must-do spots for everyone from the beginner to the expert. Although the excellent route Knight’s Move at Ragged Mountain is rated a beginner-friendly 5.4, don’t think of this as an easy climb; at the end of the route’s three pitches, it will have you wishing there were more. Knight’s Move delivers the exposure that you typically find on more advanced routes with straightforward climbing that everyone will appreciate. Despite Connecticut not being a “destination” climbing location, it has fostered an old-school culture, and the grades reflect that. 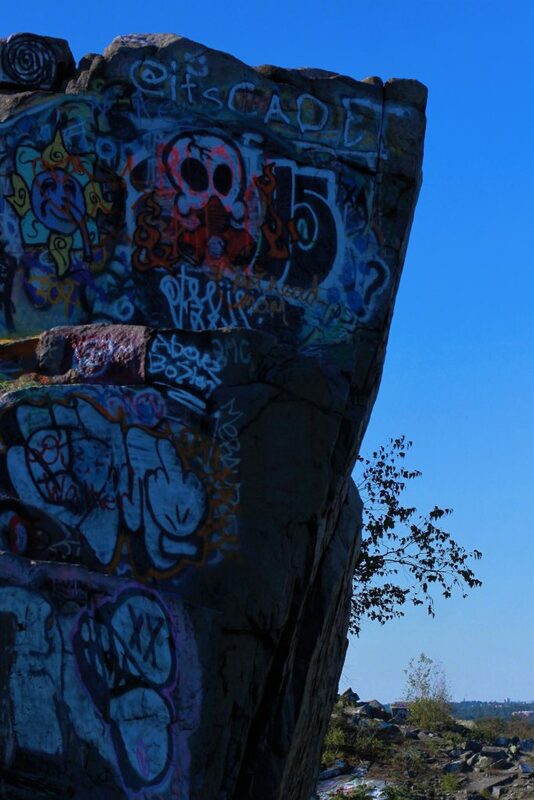 Climbers won’t find the soft sport or generous gym grading on Connecticut traprock. In that spirit, Ancient Way is another one of Ragged Mountain’s easier climbs that suits all abilities. Rated at a reasonable 5.5, Ancient Way delivers sustained and exposed climbing as you jam and stem your way to the top of the cliff. For climbers looking for more of a challenge or seeking to step up a grade or two, Pinnacle Rock offers two of the finest 5.8s in the state. Both Zambezi and Emerald City offer moderate climbing that forces you to take your technique to the next level. Whether it’s pulling Zambezi’s crux roof or fighting your way up Emerald City’s finger crack, these experiences are sure to please. The only complaint we ever hear is that customers wish the routes were longer, because they weren’t ready to be done. Unconquerable Crack, rated between a 5.9 and 5.10, is somewhat of a local test piece. While today’s climbers might find the modest grade a ways away from what is considered advanced, remember that this is Connecticut, and sandbags are prominent. Good crack climbing technique is a must if you want to send this line and so is stamina, as Unconquerable Crack offers little rest and sustained climbing…and the route only gets harder as you move up it. 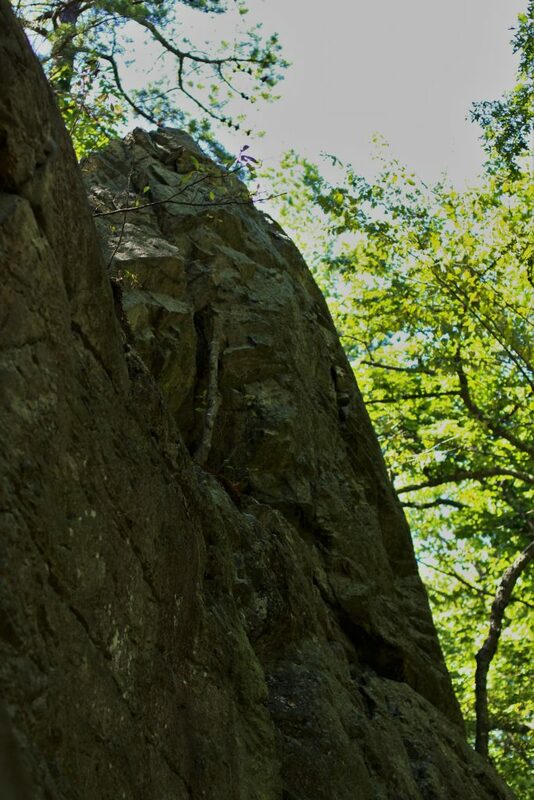 Fall is the perfect time for climbing in Connecticut, as the humidity lowers, bugs disappear, and friction increases. Mike tells me that, because of the warm nature of the rock, even days that you think will be too cold for climbing are comfortable. 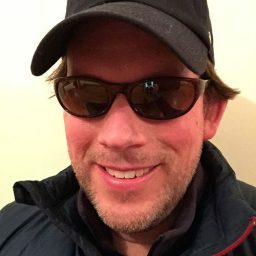 Of course, Mike is also a ski guide, and cold is his bread and butter. 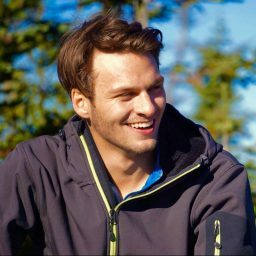 If you’ve always wanted to climb, are looking to perfect your skills, or would like to get the tour from a local, give the EMS Climbing School a call, and ask about climbing with Mike in Connecticut. And, if you nab a coveted on-sight of Unconquerable Crack, let us know—we might have a job for you. 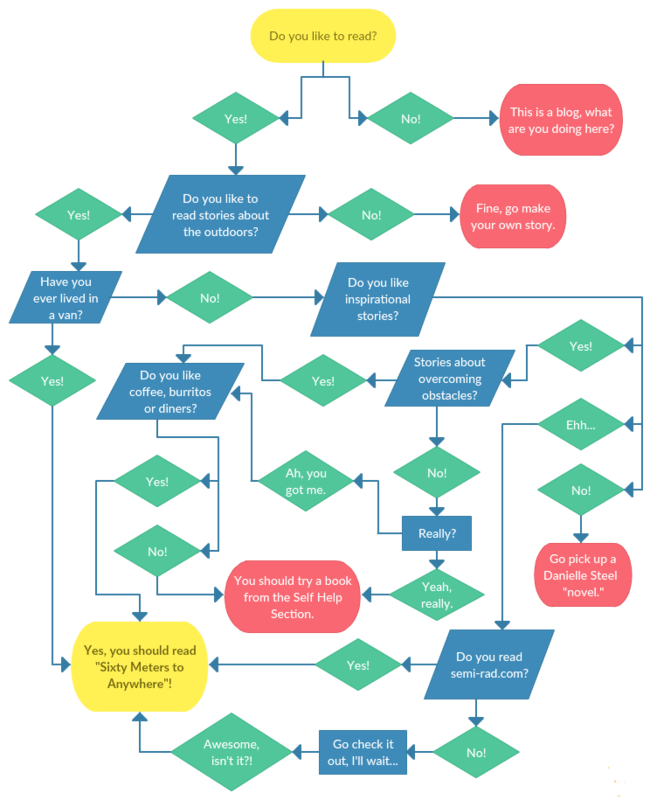 Have a few hours free this week? Skip the gym and prepare for your next trip to Rumney or Pawtuckaway at these local Boston climbing crags! I love this place. Newton’s Hammond Pond Reservation is home to an awesome collection of climbs. 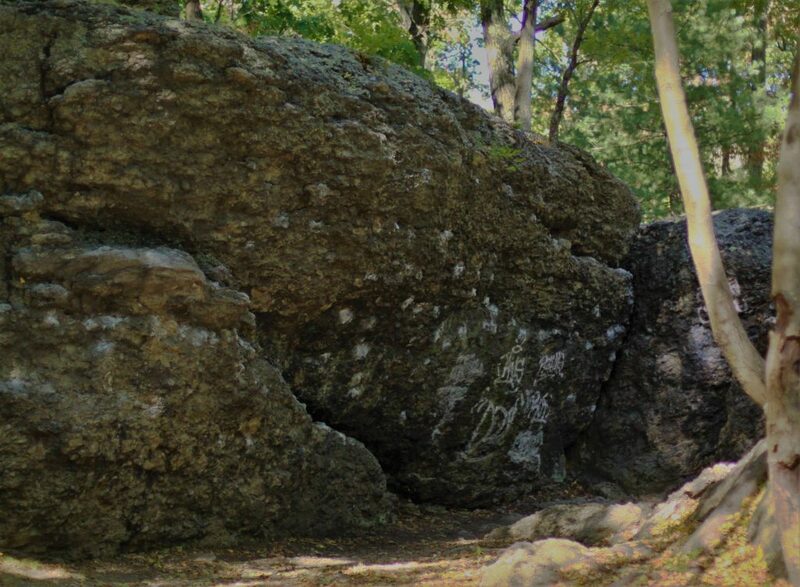 The dominant rock is Roxbury puddingstone, the Massachusetts state rock and a conglomerate that primarily consists of glacial pebbles and pockets that give the climbs here really unique but sometimes sharp features. Mountain Project lists 130 climbs throughout the reservation’s 14 crags. Most bouldering landings here are good, but as you should always do when climbing outdoors, make sure to lay down a couple pads and always use a spotter. There are a few wall cracks at Hammond Pond that offer viable trad leads, but most routes should be top-roped using extended tree anchors (30 to 40 feet). Driving: Go west on Route 9 to the Chestnut Hill Mall right before reaching Hammond Pond Parkway. Here, you’ll find parking spaces for the Hammond Pond Reservation located on the northeast side of the mall lot. Biking: Take Beacon Street west and then turn left on Woodman Road right after Boston College. Stay on Woodman, until you reach Suffolk Road and then head west until you reach the Reservation’s entrance. The T: Catch the Green Line D train to the Chestnut Hill stop and walk south on Hammond Street, until you hit the Chestnut Hill Mall. This prominent 35-foot wall sits directly toward the pond’s shore when you walk from the trailhead at the Chestnut Hill Mall; you can’t miss it! Lower Wall is an awesome place to bring beginner climbers. If you’re bringing a group, try to get there early in the morning, because this crag can get pretty crowded later in the day. When you go to climb, set up your anchor on at least two of the topside trees and extend it over the edge. Lower Wall contains climbs ranging from 5.2 to 5.8 and some pretty fun hand and finger cracks. If it’s quiet, it’s a perfect spot to practice pro placement. The Alcove is home to some of the best bouldering routes you can find in Boston. This area is slightly harder to locate than Lower Wall but well worth a few extra minutes of your time to find. When walking from the trailhead at the Chestnut Hill Mall, just take your first left onto the trail going uphill before Lower Wall. After walking a couple of minutes, you’ll find the trail squeezed between two 15-foot boulders, and you’ve reached the Alcove. The climbs here range from about V0 to V6, and it’s visited year round due to its sunny southern exposure. 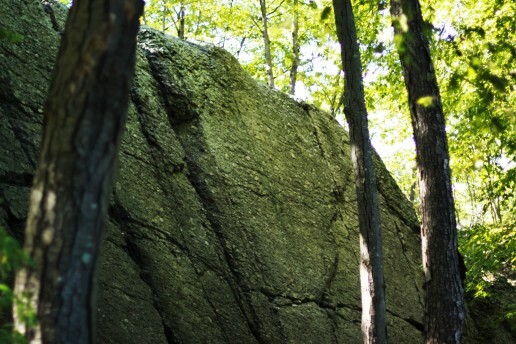 These 10 crags sit on a secluded ridgeline in the famous Blue Hills Reservation of Braintree. 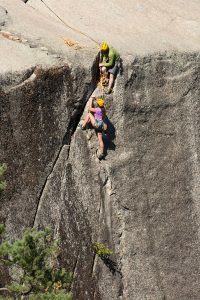 The band of 30-foot granite cliffs offers climbs from about 5.5 to 5.11, as well as a few high-ball boulder problems. Top-roping off pro here is the norm, but there are a few crack climbs that could be led if you’re feeling confident. Mountain Project lists 32 climbs in the area, but there are much more in reality. 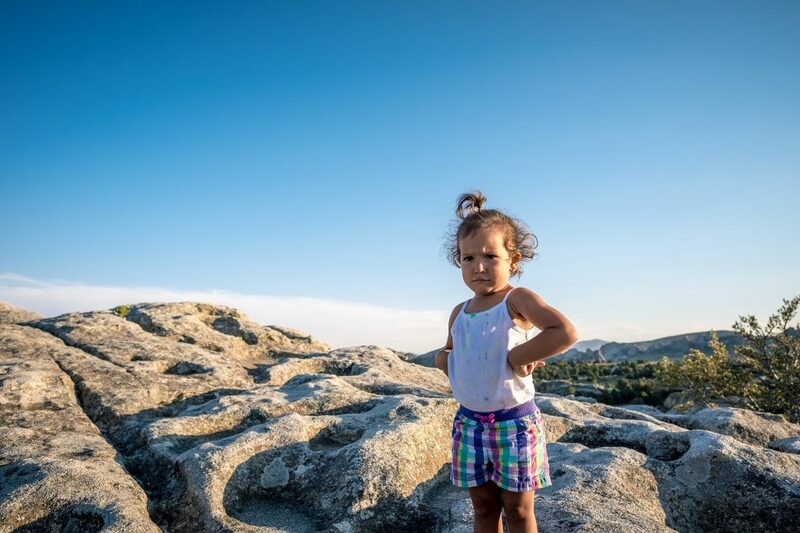 If you’re interested in exploring and documenting them, Rattlesnake Rocks is a great local spot to check out. The approach is about a 15-minute hike from the Shea Ice Rink parking lot. Take the Skyline Trail from the parking lot’s south side and hike about 10 minutes to cross Wampatuck Road. From here, continue for a few more minutes, and you’ll reach the crags. Driving: Follow Route 93 south to exit 8 for Willard Street. From Willard, keep driving south, until you see Shea Ice Rink on the west side of the road and park there. Biking: No matter which way you’re coming from, you’ll have to take a complex series of side roads, but the benefit of biking is that you can ride in directly on Wampatuck Road and pretty much start off right at the crags. The T: Take the Red Line to Quincy Adams and then switch to Bus #238 and ride to the intersection of Willard and Ames Streets. Once here, the rink parking lot is right across the street. Not a ton of info is available about this spot online, which might be a good thing. Black and White Rocks is located in the southeastern corner of the Middlesex Fells Reservation in Melrose. The rock here ranges from about 15- to 80-feet tall and is rarely visited. Most of the climbs are only a short walk from the surrounding road, and in the winter, some great local ice climbs can form. There are several undocumented routes in the area; for a more comprehensive list, pick up a copy of MIT Outing Club’s Boston Rocks guidebook. Driving: Take I-93 north to exit 33 onto Elm Street and follow it to the intersection of Woodland and Highland. Head south on Highland Avenue and take E Border Road to turn left onto Fellsway east. Drive a couple minutes north and park at the first parking area on the left. The trails across the street access most of the crags. Biking: The easiest way is to ride Fellsway north right from the Charles! The T: Take the Orange Line to Oak Grove Station and walk about 25 minutes from there to the crag. Quincy Quarries is the most well-known and photographed climbing area in Boston. The graffiti-covered granite here gets up to around 85 feet. Mountain Project lists 106 routes on the crag’s 21 faces. Usually there’s a crowd, but the rock tends to stay pretty dry. If you’re feeling it, there are a few trad routes here, but most of the climbing is top-roping off a mix of bolts and metal bar anchor points. 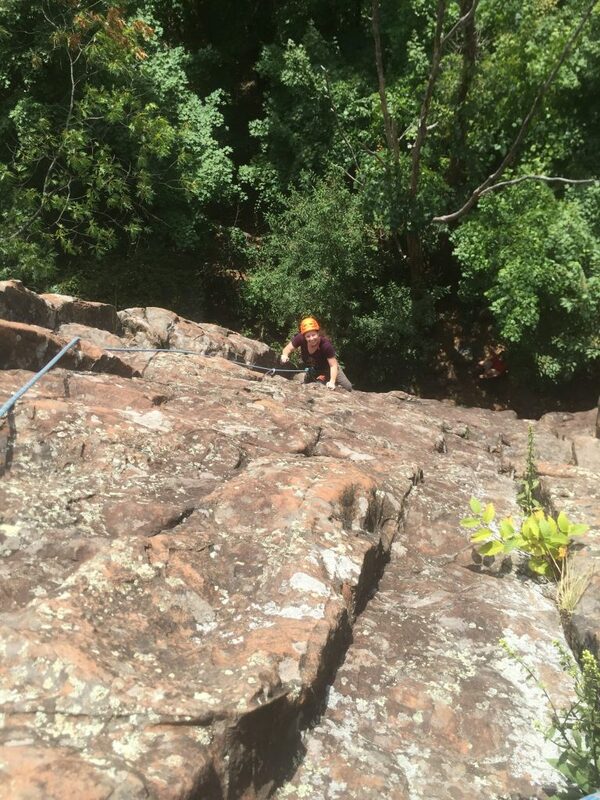 If you’ve never climbed outside before, EMS Schools offers group and private climbing lessons at Quincy Quarries! Driving: Follow I-93 to exit 8, and take your first right onto Ricciuti Drive. Biking: Follow a pretty complex series of roads. The T: Take the Red Line to Quincy Center and then switch to Bus #215 to Copeland and Willard Streets. Exit the bus, cross under the expressway, and take the first right onto Ricciuti Drive. The Quarries are on the right, a quarter-mile up Ricciuti Drive. When you’re 16 years old, you think that life goes on forever and that hospitals are just for visiting elderly relatives. The concept of mortality simply doesn’t exist in reality—until you’re struck down with a random autoimmune attack. Suddenly, you’re waking up in ICU with no memory of the last three days or why you’re strung up with tubes and shunts sticking out of your arms. Your friends are getting their driver’s licenses, and you just got type 1 diabetes. Welcome to the rest of your life with a chronic illness that no one can see you struggle with and that most people don’t really understand. Leaving the hospital, I wasn’t happy about what the rest of my life would look like. I didn’t know any better at 16, but I decided to tell myself a different story. Everything down the road seemed like it was only a fabrication of what we created and believed, so I just changed the direction. I got this notion in my head that I was destined to be a climber. I wanted to do the opposite of what the doctors and nurses told me I could do. 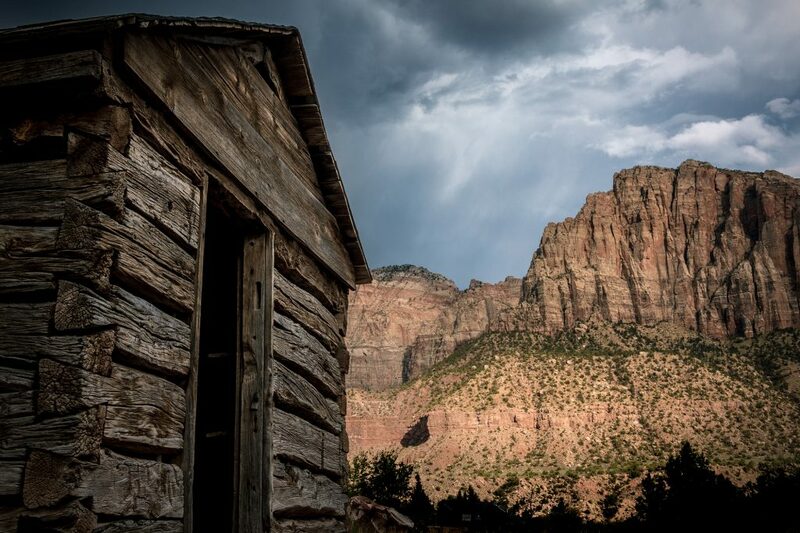 Independence seemed like a fine thing, and where better to find that than in the mountains? It took years, seven to be exact, before I internalized this narrative that adventure was truly accessible to me. Many close calls and defeats occurred along the way, but I took comfort in the idea that this wasn’t a disease limiting me—it was simply part of my climbing and that made the frustration seem worthwhile. That mantra has been my guiding principle over the last 17 and a half years. 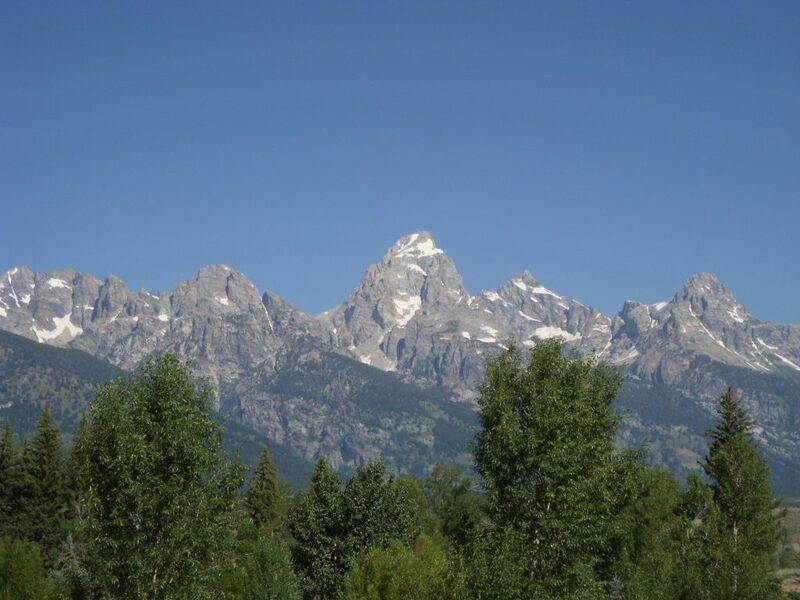 I’ve climbed in the Bugaboos of British Columbia, the big walls of Zion National Park and Yosemite, crags in Idaho, and boulders in Bishop, California. I’ve also climbed in Kansas, Oklahoma, and other obscure areas I’ve come across in my travels. Adventure is the bigger picture into which everything else fits—or doesn’t. Having that established has made life decisions simpler. Adventure literally is my medicine. Adventure is often romanticized as an escape from the turmoil of life, bills, and the ugliness that feeds the 24-hour news cycle. 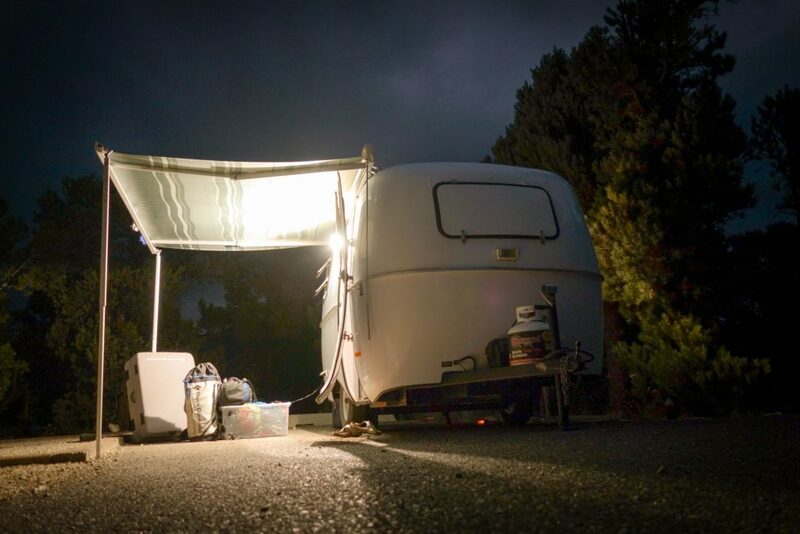 As an adult with a wife and child to support, I decided a year ago to buy a tiny trailer and make the move to become a full-time road-dweller. I’d spent years traveling in four-to-six-month cycles, but never fully committed to making it a permanent lifestyle. I had just put in my notice at a cubicle job that had promised me the world, but delivered mostly boundaries and limitations. I barely qualified for the loan that made the tiny, egg-shaped Scamp trailer officially our new home. My only thought at that time was getting out of the suburbs where I could never see the sky and out onto the road, where I would never have to read another HR memo. Before we knew it, we were out there—skies for days. But, with freedom comes responsibility. It’s remarkably like life anywhere else. Ups, downs, sacrifices, and choices. Beauty and ugliness. Adventure isn’t “out there”—it’s in here. This is the part they always leave out in those Tumblr memes. Someone smashes your car up and your insurance takes months to decide that it can’t be fixed, and you’re scrambling to find a couch to crash on and a ride to the grocery store. You’re on an austerity budget, because your new freelance career hinges on being able to babysit your 2-year-old while editing video or writing proposals. Climbing? Oh, that would be nice, but weekends aren’t a thing anymore, because now you’ve got to hustle in your free time to pay the bills. To be fair, it hasn’t been all frayed nerves and hateful scrambling to survive. There have been long days of climbing in the alpine. There have been magnificent nights painted by the Milky Way. There have been really wonderful and casual mornings spent enjoying coffee, watching the little one play in the dirt—evenings of rock scrambling as a family after dinner. It’s remarkably like life anywhere else. Ups, downs, sacrifices, and choices. Beauty and ugliness. Adventure isn’t “out there”—it’s in here. These days, I just want to climb more and make better films and photographs to empower people to find adventure as medicine for their own challenges. Full-timing probably isn’t the best way for me to accomplish those things. Sometimes, the adventure gets in the way of the adventure. I still believe that adventure is medicine—bitter medicine at times. Character building. Not because it’s all fun and scenic. Those moments are sprinkled throughout, sure, but you’ll work for them. It’s not a vacation—but it is worth it. Adventure is not an escape from anything. Get out of debt before trying to full time. Have a means of providing for yourself proven and nailed down. Avoid the combination of new variables (for instance, self employment and full timing). Know what you’re sacrificing for the lifestyle. Have fun. It’s not a default out on the road. It’s a choice and probably the most important one you’ll have to make over and over again. 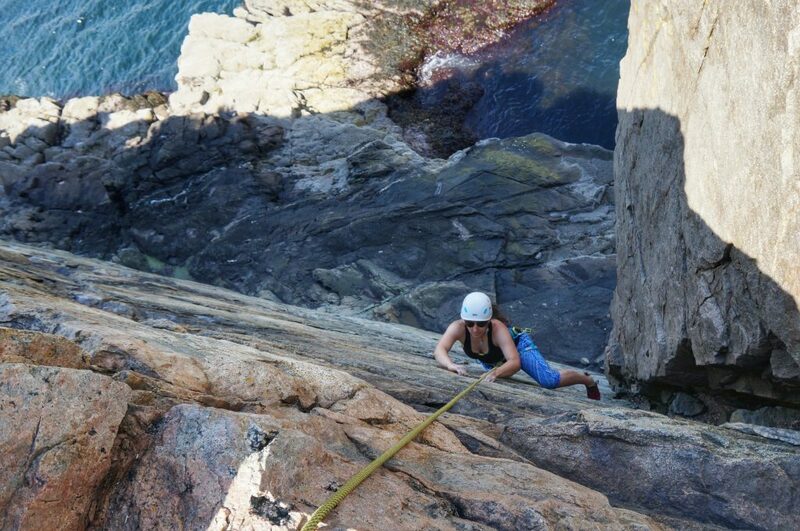 From the Precipice to the Bubbles to Great Head, Acadia National Park is full of great climbing destinations. But, in spite of all the fantastic spots, one place stands out among the rest: Otter Cliffs. 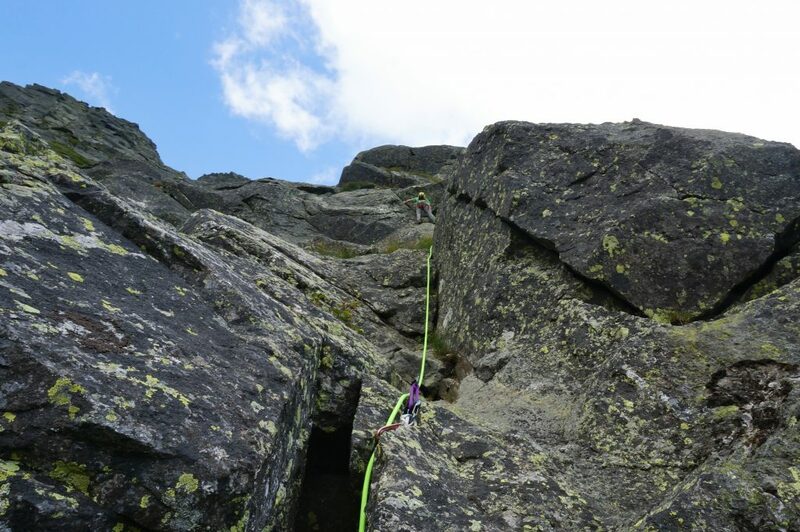 While New England may offer many larger and more imposing walls, nothing compares to climbing on this relatively small crag. Rising roughly 60 feet out of the ocean, this collection of compact granite cliffs provides incredible rock, fun routes, and one of the most picturesque and unique climbing experiences anywhere. In addition to the Instagram-worthy setting of Otter Cliffs, there is something incredibly exciting and intimidating about the moment you commit yourself to the climb and either rappel or get lowered down to the lapping waves below. 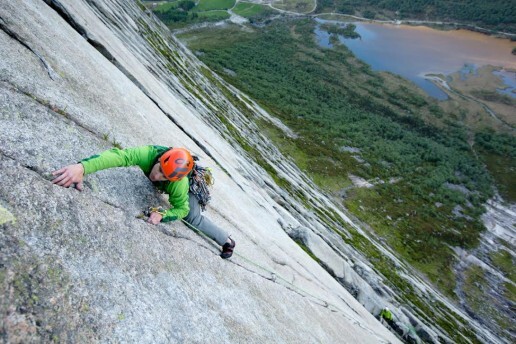 From the bottom, the walls look steeper than they did at the top, even on the crag’s moderate routes. After pulling yourself onto the rock, you quickly realize that this isn’t Cathedral granite or Rumney schist. Although the walls are composed of granite, the ocean’s tides, waves, and mist make the first few moves of most Otter Cliffs routes pretty spicy, with damp, greasy hand-holds and slick feet. Another thought occurs when you arrive at the bottom of the cliff: You’re committed. While commitment is something all climbers face, there is an unnerving feeling exclusive to being at the bottom of a sea cliff. Despite being a climber accustomed to all of these uncomfortable positions, you sense something powerful about the ocean under your shoes, the tide rising, and the knowledge that the only way up is to climb. 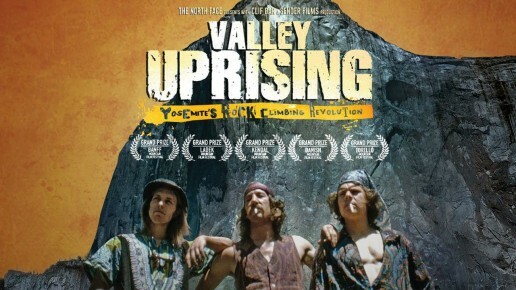 Well…In all honesty, climbing isn’t really the only way up. However, it is, perhaps, the most convenient and certainly the most dignified way back to the top. 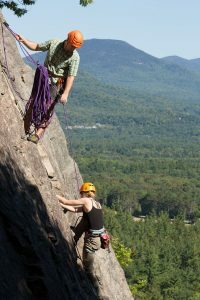 While Otter Cliffs provides such an experience, it also presents a unique set of challenges and requires a different set of skills from most of the other popular New England crags. If its seaside location, amazing routes, and impeccable granite weren’t enough to entice you, the approach will, as the crag is less than a five-minute walk from Park Loop Road. To find it, just follow the hiking path on the ocean side of the road and look for the climber’s path leading to the cliff. If you are there during the busy season of July and August, you’ll very likely hear the climbers before seeing them. Before reaching the cliff, you will encounter a climber registration box — don’t forget to sign in, as it helps the National Park Service monitor climbers’ use of the area. 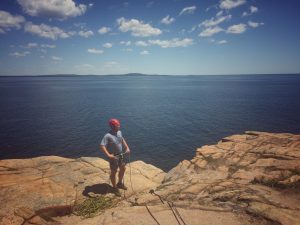 During the height of Acadia’s climbing season, the top of Otter Cliffs can resemble a spider web, as numerous parties will have anchors strewn across. While there are some fixed anchors available, many of Otter Cliffs’ climbs require a gear anchor. It’s also worth noting that due to the heavy use this cliff sees, building anchors using trees is frowned upon. If you aren’t familiar with building your own anchors, brush up on your skills with a lesson from EMS Climbing School. As you learn about gear anchors, you can also brush up on other skills valuable to Acadia-bound climbing, such as top-down belaying and hauling. 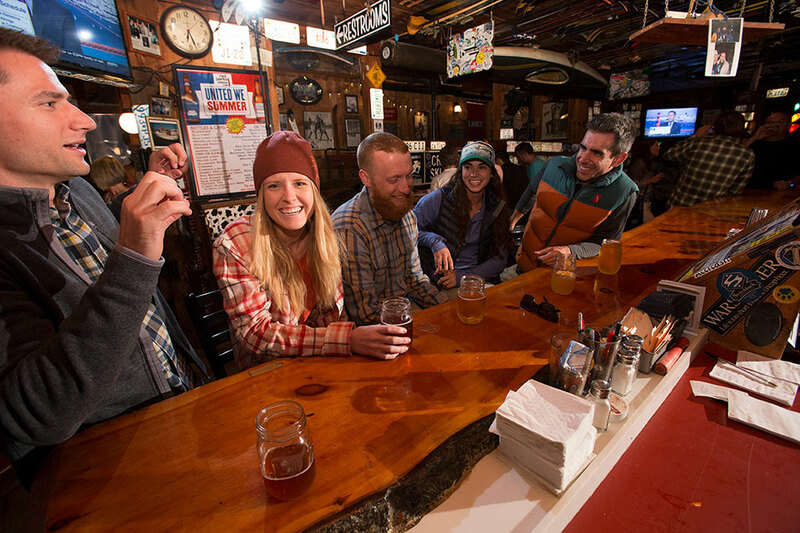 As a side note, there is also a good chance one of our AMGA-certified guides can give you a few pro tips, such as the island’s best routes, places to camp, and spots to grab a beer. The Great Chimney is perfect for warming up and getting acquainted with the island’s climbing, as it’s rated a beginner-friendly 5.5. But, don’t let that fool you: Even experts appreciate climbing this stunning location, as this route ascends the chimney between a freestanding sea stack and Otter Cliffs themselves. Climbers looking to push themselves a little harder need only to move over a few climbs to the Yellow Wall. Moderately graded at 5.8, this spot is known for a yellow lichen-covered arete, hence its name. This route places climbers on the wall’s edge, only increasing the exposed feeling of climbing above the crashing ocean beneath you. Climbers interested in trying a local test piece need only look few climbs over from Yellow Wall to Guillotine. I have seen it graded anywhere from 5.10a to 5.10b to 5.10-, but it has always felt harder than that to me. Forcing climbers to use all their tricks, Guillotine begins at the wide crack around the arete from Yellow Wall. As you ascend, follow the route’s small face holds and thin cracks while attempting to conserve enough energy for the pump-like crux at the roof. If you manage to cruise the crux, you’ve exceeded my ability and are welcome to leave your grading recommendation in the comments. By tackling its great routes, ascending its amazing rock, and seeing a one-of-a-kind location, most Otter Cliffs climbers won’t even care that they one-hung Guillotine, because it gives them an excuse to go back and try again.